A few minutes into a conversation with Steve and Linda Dashew, the couple behind Dashew Offshore and the owners of Cochise, the first Dashew Offshore FPB 78, we are deep into topics that make my head spin: stability, harmonic rolling and polar moments. Such detailed technical specifics are inherent to the philosophy behind the couple’s designs, and their boats naturally attract like-minded customers — people buying Dashew Offshores tend to be very experienced cruisers. We’ve just sat down in comfortable armchairs in what they call, justifiably, the “great room” on Cochise, when Steve brings up Yogi, the 60.2 metre superyacht that sank in the Aegean Sea in February 2012. Large motor yachts, like high tonnage commercial vessels, have little tolerance for heeling beyond 45 degrees, Steve says. With a bit of bad luck, even moderate waves can push a listing boat to the point of no return. A post-incident report on Yogi stated that the “vessel was technically beyond reproach and fully complied with the requirements of the French administration”. It detailed a series of failures that led to the yacht’s demise, including engine malfunction due to water intrusion and loss of steering. One glaring omission in this report, Steve says, is that it fails to mention the role played by the limited stability that is considered adequate by most class rules, including the MCA. It’s not unusual for the American to question what’s widely accepted in the maritime world. 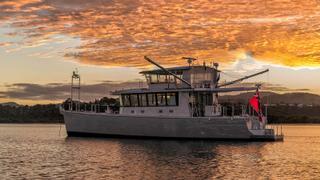 Circumnavigator James Hamilton, who owns the Nordhavn 52 Dirona, wrote in a blog entry recounting his impression of Cochise that Dashew harbours “a complete disdain for industry dogma”. Steve combines healthy scepticism with vast experience. He and Linda have written reference books on weather, seamanship and offshore cruising, but their primary occupation for years was designing and building solid cruising sailing boats. In 1994 they retired from boatbuilding forever — or so they thought at the time. A motor yacht named Wind Horse changed that. 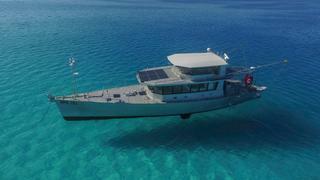 It was a completely unconventional explorer yacht, all aluminium and shallow except for big underwater appendages. 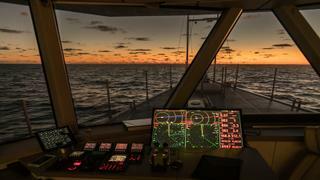 They cruised on it part-time for seven years and covered 67,000 nautical miles. Their journeys and articles caught the attention of like-minded cruisers and, before long, they were boatbuilders again. “The boat business is like malaria; you think you have it beat and then it comes back,” Steve says. The prospect of having to test this seems unlikely as Cochise sits in a dock in a sheltered inner canal in Fort Lauderdale. However, it’s not a place where you’d find the couple very often. In fact, as we emerge from the engine room to face the Intracoastal Waterway busy with a stream of centre consoles, Steve admits this is not his kind of place. 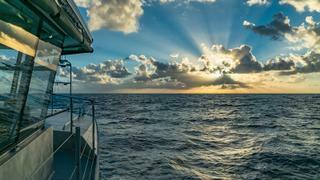 Cochise’s shakedown cruise was some 11,000 nautical miles long in three months. And at the time of writing the boat had covered 12,500 nautical miles, averaging 14 knots between Fort Lauderdale and Southport, North Carolina. From Whangarei on New Zealand’s North Island, where Cochise was built at Circa Marine, the Dashews headed to Fiji with plans to return to finish a list of small fixes that winter had interrupted. But the boat performed well and the Dashews, who wanted to return to their home in Arizona in time for the college basketball season, decided to press on instead. The intention was to reach Fort Lauderdale, where they would dock the boat and catch a flight back to Arizona to watch their beloved University of Arizona basketball team. 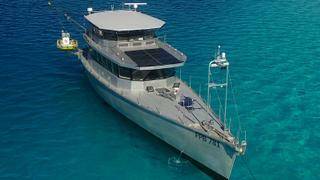 They left Fiji on 8 October, 2016, stopped in Ra’iātea in the Society Islands for a few days and topped up their fuel tanks, then headed for Panama. The 4,700 nautical miles, against the trade winds or, as Steve says, “uphill”, was done at an average speed of 10 knots, with Cochise burning nine tenths of a gallon an hour, leaving more than enough fuel to reach their next destination. In Panama a tropical storm became Hurricane Otto. 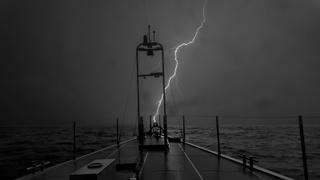 They ducked into a sheltered bay with other boats while the storm battered the small S-shaped country. It left at least four people dead before churning on towards Costa Rica and Nicaragua. On 24 November, Thanksgiving Day, the coast was clear again. Linda had made two pies to share with the other boaters but the basketball season called. They headed out, foregoing the traditional feast, and Cochise arrived in Fort Lauderdale on 3 December, just before league play started. They are back on America’s East Coast getting ready for trips with their grandchildren when I visit. I have no trouble spotting Cochise along the canal. 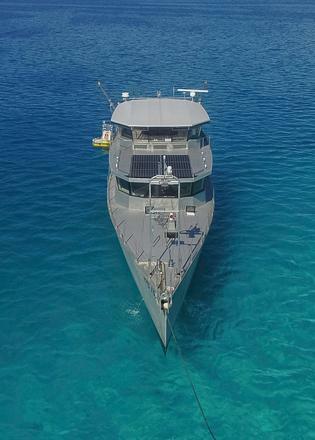 Its unpainted aluminium hull is reminiscent of a naval interceptor or patrol boat — an illusion that the Dashews don’t mind creating as they travel to the planet’s most isolated locations. 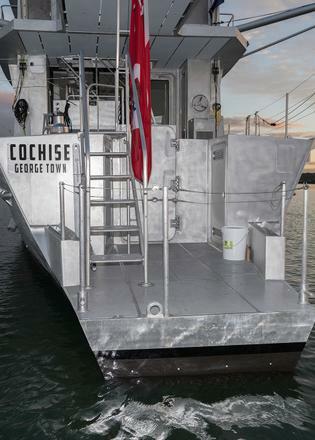 What sets Cochise apart from most combat ships, however, are the large windows wrapping the main deck and what the Dashews call the “matrix” deck above, an enclosed flybridge deck/upper saloon. 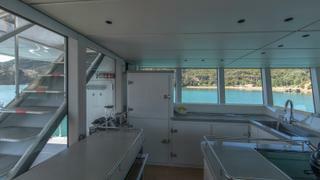 Of the two main decks, the lower deck is for guest and crew accommodation. A simple, light hued décor, pictures of nature and careful lighting compensate for the lack of natural light below. The only openings on that level are for air ducts drawing fresh air from vents on the upper deck, judiciously positioned to cool Cochise even when they are not using air conditioning, which is often. The Dashews turned to residential designer Denise LaVey to create Cochise’s softer side. “I tend to favour subtlety and simplicity over complicated and fussy,” says LaVey, who ranks this as one of her two favourite projects. The residential designer admits that at first she was intimidated by the amount of glass on the main and matrix decks, but later realised that it fitted her design philosophy of simplicity and subtlety. “You let the environment and the light do the heavy lifting, and just assist it with certain elements,” she says. “The main concern is to have fabrics and soft goods that are environmentally tough [and] able to withstand a saltwater environment without breaking down. 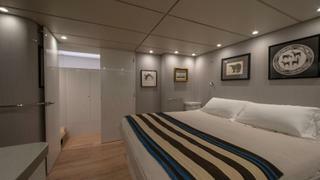 With linens and towels, there is, as with any yacht, the concern of storage limitations. That’s something I think people often forget… you’re competing with spares and provisions. The “great room” is the heart of life on board Cochise, with an open plan layout that is very inviting and perfectly suited to owner operators who spend a great deal of time on board. 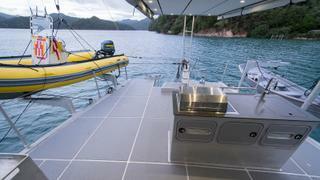 Here you can cook, entertain and steer the boat from a surprisingly compact helm station, located on the port side. 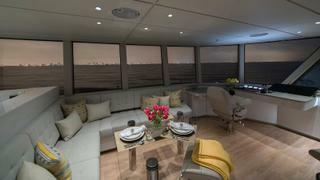 It’s the ultimate social space, and there is no lack of visibility through panels of thick and laminated glass. 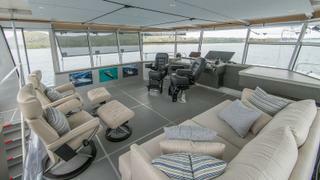 But should you need to see further, another helm is set up on the matrix deck above; along with a seating area that offers incredible views. Steve, according to his philosophy, goes for proven and simpler systems controlled via two streamlined helm stations, plus a portable wing one. He found out that he did not need Cochise’s bow thruster so he had it decommissioned and covered the opening with a plate. “The propellers and large rudders that rotate through 90 degrees do all the work,” he says. He uses oversized Naiad fin stabilisers for comfort in heavy weather. The engine room containing two 230hp, six cylinder John Deere diesels is laid out so that everything is easily accessible. 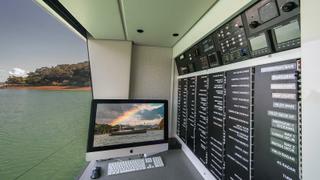 Similarly, there is no backing to the cabinets, so you can view and access all that’s behind. “I want to see the structure, I want to see the insulation and the systems, ” Steve says. After passages, a high-pressure water hose knocks off the salt and there are no teak decks to refinish or touch-up painting to do, so maintenance is limited. However, despite lacking some of the luxuries of modern superyachts, Cochise was still not a cheap boat to build. She is made with high quality aluminium that exceeds Lloyd’s ice class requirements and that may bend under blunt trauma but won’t puncture. The combination of massive strength, six watertight compartments and a double bottom allow room for “operator error”, an engineering concept that has been tested by two of the FPBs. The insulation is a flexible EPDM closed cell elastomeric, laminated with a self adhesive, which not only resists moisture but is also an effective noise dampener. “It costs a small fortune,” Steve says, but it is well worth it. 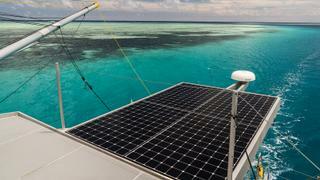 Solar panels replenish a high-capacity traction battery bank, ensuring that Cochise is not dependent on her Onan generator. But a lot of the cost comes from something less tangible. Steve estimates that 18,000 man-hours went into Cochise before a single cut was made. During the Dashew engineering phase, everything, including where pipes and wires will run, is decided. A CNC machine then cuts the pieces precisely according to CAD files, including holes for the ducts. This goes for the aluminium plate and the furniture. 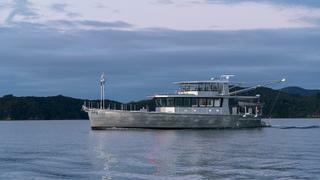 Hull No 2 of the FPB 78, Grey Wolf II, which has been delivered and has started cruising, was built to comply with the MCA’s rules for Category 0 — stringent requirements for unrestricted navigation that apply to vessels under 24 metres intended for commercial use — so it may be offered as a yacht for charter. Speaking of size, Cochise feels quite a bit larger than a usual 24 metre. Some of that is attributable to the amount of glass, the light interior, and the open plan design. But as it turns out, from end to end, she is quite a bit bigger, 26.27 metres in fact. Achieving this requires a bit of fancy footwork but it is completely within the rules. She simply is a big 24 metre. And in case that is just too small, Dashew Offshore has built a bigger boat. The Dashew FPB 97, 33 metres overall, was nicknamed Wicked when she launched in 2015. She is now named Iceberg and tries to stay under the radar, something that the Dashews don’t seem to be able to do.